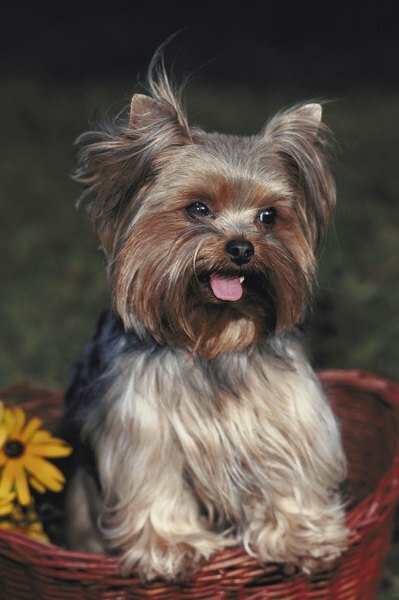 The diminutive Yorkie requires lots of protein to fuel the growth of his constantly growing coat. With a reputation for being fussy eaters, Yorkshire terriers are the treat connoisseurs of the dog world. They also require lots of protein for their coat, which grows like human hair. Packed with protein, these homemade treats taste yummy enough for even the most discriminating Yorkie. Playful, bouncy and inquisitive, the diminutive Yorkie requires up to 35 percent of his daily protein intake to fuel the constant growth of hair and keep his skin healthy. Protein-based treats contribute to this significant nutritional requirement along with the regular diet. Here are three treat recipes that include high-quality protein from eggs, meat, cheese and whole grains. Homebaked goodies are hard for any dog to resist, and when they're made with wholesome ingredients, you know your Yorkie is snacking on something that's good for him. These crunchy, sweet-free treats also address the high incidence of dental disease in the breed and give his teeth and gums a workout. Crunchy, grain-free and loaded with protein, liver snaps are a Yorkie favorite. To prepare, preheat the oven to 300 degrees Fahrenheit. Puree 1 pound of chicken livers in a food processor and pour into a bowl. Clean the food processor immediately to avoid a messy cleanup later. Add 1 1/2 cups of garbanzo bean flour and two fresh, free-range chicken eggs to the liver and mix thoroughly. Line a jelly roll pan with aluminum foil and pour the mixture into the pan. Bake for 30 minutes. Remove from the oven and cut into tiny portions using a knife, pizza cutter or small cookie cutter. Turn the oven down to 150 degrees Fahrenheit and bake the treats for two more hours. Remove from the oven and let cool on a wire rack. Store treats in an airtight container in the refrigerator. These delicious little cookies will have your Yorkie doing a happy dance, and they're made with healthy, homemade chicken broth. To prepare, preheat the oven to 325 degrees Fahrenheit. Chop 12 ounces of boneless, skinless chicken thighs and place into a saucepan with 17 ounces of cold water. Bring to a boil and simmer for 15 minutes until the chicken is cooked through. Remove the chicken from the water and set aside to cool. Reserve the broth and finely shred the cooked chicken. In a large bowl, combine 1/2 cup of brown rice flour, 1/2 cup of oat flour, 2 ounces of wheatgerm, one beaten egg, 4 ounces of olive oil, one tablespoon of dried tarragon and one tablespoon of dried parsley. Add the chicken and mix thoroughly. Slowly add 6 ounces of the reserved broth to make a dough. Place tiny spoonfuls of the dough 1/2-half inch apart on a greased baking sheet and flatten with a spoon. Brush the cookies with a beaten egg. Bake for 25 to 30 minutes, or until firm to the touch. Remove the cookies from the oven and cool completely on a wire rack. Store any leftovers in the refrigerator up to two weeks. Boasting a trio of delightful doggy favorites, these treats whip up in a snap. To prepare, preheat the oven to 350 degrees Fahrenheit. Cook six slices of bacon until crispy, then finely grind in a food processor. In a large bowl, combine one cup of oat flour, one cup of brown rice flour, 1/2 cup of grated low-fat cheddar cheese, 1/2 cup of unsweetened applesauce, 1/2 cup of old-fashioned rolled oats and one egg. Mix thoroughly until doughy. Roll out on a lightly-floured surface to 1/4-inch thick. Cut with a tiny, bone-shaped cookie cutter or make different shapes with a knife or pizza cutter. Place close together on a baking sheet lined with aluminum foil and bake for 20 to 25 minutes until golden brown. Remove from the oven and let cool completely on a wire rack. Store leftovers in an airtight container in the refrigerator.